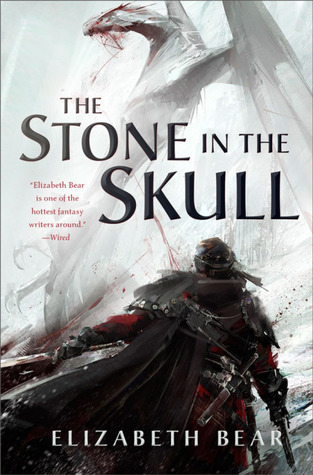 The Stone in the Skull is the start of a sequel trilogy to Bear’s epic fantasy series that began with Range of Ghosts. However, you do not need to be at all familiar with the previous series. The Stone in the Skull takes place over fifty years later and has an almost entirely new cast. It also moves the narrative south to the Lotus Kingdoms, a setting based on pre-colonial India. Trouble is brewing in the Lotus Kingdoms. What was once a great empire has shattered into principalities ruled by the emperor’s descendants. Among them are two women, both struggling to hold on to their own thrones and independent power. Sayeh is regent for her three year old son, given to her by the divine intervention of the gods. But her kingdom is a poor one, and they struggle to find water during the dry season. If the potential strife with her neighboring cousins weren’t enough, natural disaster looks likely to strike Sayeh’s country. Mrithuri is a twenty-four year old woman who rules her kingdom in her own right, but she’s under increasing pressure to marry, which would mean handing over authority to her husband. And the options for a husband to be are distasteful: two male cousins who mass armies on her border. She desperately awaits a message from her great-aunt, the wizard of Messaline, whom she hopes will bring her some form of aid. Her great-aunt has sent her message with the Gage, a brass automaton who was created to serve a wizard but has outlived his creator. Accompanying him is his friend, the Dead Man, a survivor of the deposed Uthman Caliphate who has since become a mercenary. They may think themselves only messengers, but the wizard of Messaline has plans for them in the Lotus Kingdoms. The Stone in the Skull has hints of grand quests, but it is much more of a political intrigue fantasy than Bear’s last trilogy. It may very well appeal to those who enjoy stories such as Game of Thrones but want something less grimdark and with a more diverse cast. I’m grateful that Bear chose this route for The Stone in the Sky. While the plot line is still a bit familiar, it was less so than the epic quest, evil wizard story of her last trilogy. I didn’t find the plot line to be super thrilling, fast paced, or exciting, but it worked all right. And anyway, Bear makes up for it with her lush world and fantastic characters. The world was undeniably my favorite part of Range of Ghosts, so I’m glad she decided to explore a new corner of it. She has a marvelous gift for embedding her settings and descriptions with true magic and wonder. The she paints a brilliant picture of gorgeous architecture, scents, clothing, and even the sky overhead, a river of stars with a cauled sun that leaves the lacy shadows of an eclipse. Bear veers from the norm when it comes to fantasy settings. Her world is clearly non-Western, and the Lotus Kingdoms are inspired by historic India. The setting is a fresh breath of air for a genre often too preoccupied with medieval Europe, and I like how she moves up the historic time line, offering a fantasy that’s not quite steampunk but including elements such as guns. And of course, the Gage, a character I couldn’t help but love. In fact, I liked all of the central characters. The Gage and his backstory never ceased to fascinate me, and I can’t wait to see how he develops in the sequels. I loved the friendship between him and the Dead Man, who’s got his own tragic tale. The Dead Man may fall into some familiar character types, but he’s well drawn and not overly angsty. And of course, I always love the wide variety of female characters Bear includes in her work. Mrithuri and Sayeh are both incredible female leads, and Bear surrounds them with other noteworthy women. I am intrigued by Mrithuri’s addiction to the poison of a serpent, as it’s not a topic I’ve seen often explored in fantasy. I also appreciate how Bear includes queer characters, particularly Sayeh, a trans woman who’s gender is never questioned by the narrative. However, I have yet to see any reviews of The Stone in the Skull by trans reviewers, so if you come across any, I would be very interested to see what they have to say. My only complaint in regards to the characters are some romance sub-plots that feel a bit like insta-love. Thankfully, this isn’t two tedious when I like the characters involved. I started out unsure whether or not I’d continue with the trilogy The Stone in the Skull starts out, but by the end this enchanting story had won me over. Are you planning on reading this one too? I’m looking forward to December, when I’ll get a break from the new release grind.